BG Technologies, founded in 2002, is a small woman-owned industrial electronic distributor. With over 130 years of combined industrial electronic experience, the company excels where many distributors fall short. Whether sourcing hard to find parts or solving challenging applications, BG Technologies is always willing to go the extra mile for our customers. Products offered from the company range from inductive sensors to laser measurement scanners and contactors to PLCs. 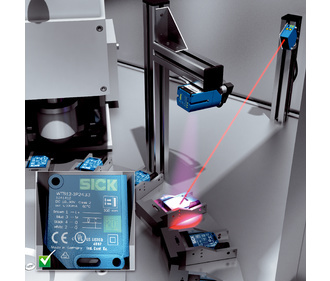 Sick, BG Technologies’ flagship vendor, provides industrial and safety sensors, barcode scanning equipment, encoders, and vision technologies. As a Sick Summit Distributor, the company has the technical expertise and demonstration equipment to solve even the most demanding applications. BG Technologies is proud to be a flagship partner with SICK Sensor Intelligence, one of the world’s leading manufacturers of sensors, safety systems, machine vision and automatic identification products for industrial applications. The powerful PowerProx MultiTask photoelectric sensors offer all of the advantages of time-of-flight technology in the world's smallest sensor housing to date, giving maximum flexibility when designing machines. Objects being conveyed at high speed, small and flat objects, and jet-black or shiny objects can now be reliably detected at sensing ranges between 5 cm and 4 m. PowerProx also provides stable detection results over a large detection angle. The “Distance”, “Speed”, “Precision”, “Small”, “Micro”, and “WTT280L” versions are designed to be used in different applications. This means that PowerProx always offers perfect solution – for empty bay detection via rapid counting right through to use in handling and assembly. New Programmable Stack Light from Patlite!